The goal of this article is to explain how Zevenet Subscriptions work and how to configure Zevenet Enterprise Edition subscriptions to maintain updated your Zevenet appliances in a very automatic way. 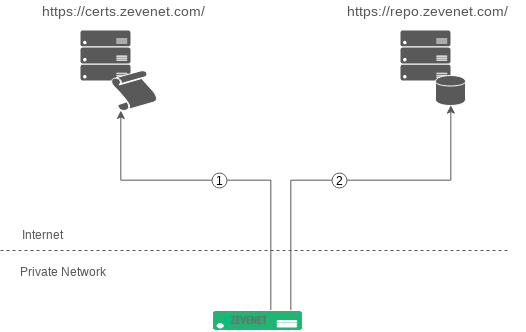 Zevenet Enterprise Edition connects to https://certs.zevenet.com/ in order to check your Subscription Plan status and once this system confirms the access is granted, then it connects to https://repo.zevenet.com/ in order to check the package updates. Please follow the next steps in order to enable your Subscription Plan in the Zevenet Load Balancer Enterprise Edition appliances. Firstly, please ensure you’ve the appliances deployed and activated. 2. If your Zevenet package is in a previous version please apply the latest release that you received at the moment of the Subscription Plan acquisition. 3. If required, configure the proxy when a direct connection to the Internet is not allowed. Edit the global.conf file and configure the $http_proxy and $https_proxy variables as follows. Change USER and PASSWORD for the given proxy credentials. Change PROXY_IP with your own proxy IP or proxy name. Change PROXY_HTTPS_PORT with your own proxy port that accepts HTTPS. Ensure that the proxy IP and proxy port is reachable from the Load Balancer, you can use telnet for these tests. Repeat this configuration to every Zevenet appliance that requires to have access to the remote repository for updates. Zevenet appliances are fully integrated with the Linux operating system based in a GNU/Debian environment, so once the release Zevenet 5.2.10 or higher is applied you will be able to update the Zevenet system as any other GNU/Debian via APT repository, please refer to the following commands to be applied in order to maintain the appliances up to date. Update the database of packages in your Zevenet appliance from the remote APT repository. Need to get 1,764 kB of archives. Search a certain package in the local database. Read the contents and information for a certain package. Zevenet Load Balancer is based on a GNU/Debian system and fully integrated with the APT repository services. Although, it doesn’t mean that Zevenet packages are fully compatible with Debian mainstream packages, as this has been designed to be optimized and ready for high availability, scalability and security of applications. It is capable to add third parties APT repositories for certain packages, but use this at your sole responsibility. System updates and upgrades are only supported from the official Zevenet APT repositories. In addition, for security reasons, only accept updates from signed package repositories.